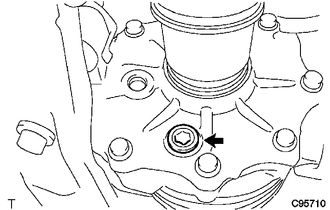 (c) Using a 10 mm hexagon wrench, install a new gasket and the rear differential drain plug. (d) Using a 10 mm hexagon wrench, temporarily install the rear differential carrier cover plug. Add differential oil before installing a new gasket and fully tightening the rear differential carrier cover plug. (a) Disconnect the electro magnetic control coupling sub-assembly connector and vacuum hose. (b) Remove the 4 bolts. (c) Using a brass bar and a hammer, tap the electro magnetic control coupling sub-assembly to remove the electro magnetic control coupling sub-assembly from the rear differential carrier assembly. Do not drop the electro magnetic control coupling sub-assembly. 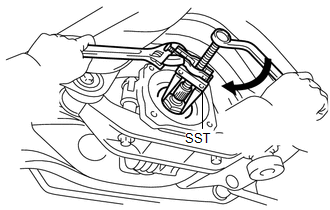 (a) Using SST and a hammer, install a new diaphragm oil seal into the rear differential carrier assembly. (a) Install the transmission coupling spacer to the rear differential carrier assembly. 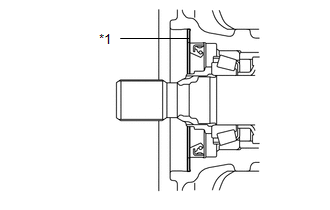 Keep the transmission coupling spacer free of oil and foreign matter. 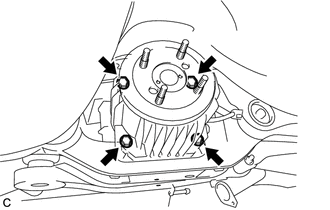 (a) Install the transmission coupling conical spring washer to the rear differential carrier assembly as shown in the illustration. 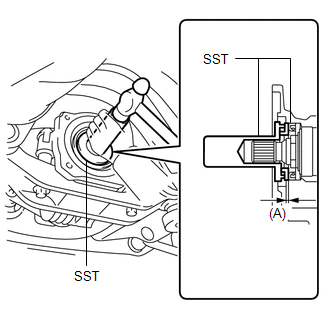 Keep the transmission coupling conical spring washer free of oil and foreign matter. (a) Using a scraper and wire brush, remove the seal packing from the rear differential carrier assembly and electro magnetic control coupling sub-assembly. Be sure to completely remove all seal packing from the rear differential carrier assembly and electro magnetic control coupling sub-assembly. Do not allow the removed seal packing to enter the rear differential carrier assembly and electro magnetic control coupling sub-assembly. (b) Using a non-residue solvent, remove grease and oil from the contact surfaces of the rear differential carrier assembly and the electro magnetic control coupling sub-assembly. 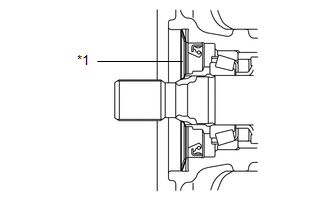 (c) Apply seal packing to the areas indicated in the illustration of the rear differential carrier assembly. Start applying seal packing within range (A). Make sure that the clearance from the center of the bead is within 1 mm (0.0394 in.). Apply seal packing in a continuous bead 2 to 3 mm (0.0787 to 0.118 in.) in diameter. If there is an area where seal packing is not applied in a continuous bead, be sure to apply seal packing by overlapping the ends of the bead at least 10 mm (0.394 in.). Stop applying seal packing after allowing it to overlap with the beginning of the bead by at least 10 mm (0.394 in.) within range (A) in the illustration. Install the electro magnetic control coupling sub-assembly within 10 minutes after applying seal packing. If the electro magnetic control coupling sub-assembly is not installed within 10 minutes after applying seal packing, completely remove and then reapply seal packing. After installing the electro magnetic control coupling sub-assembly, do not immediately add oil or drive the vehicle for at least 1 hour. (d) Install the electro magnetic control coupling sub-assembly with the 4 bolts. Do not damage the diaphragm oil seal. Do not damage the contact surface of the rear differential carrier assembly and electro magnetic control coupling sub-assembly. (e) Connect the electro magnetic control coupling sub-assembly connector and vacuum hose. 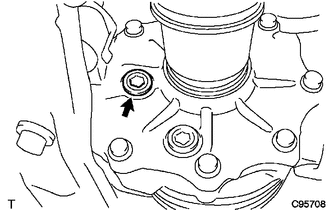 (a) Remove the rear differential carrier cover plug. 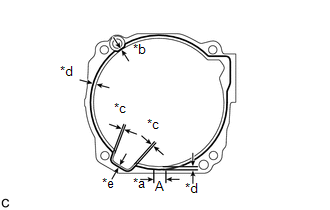 (b) Add differential oil (See page ). (a) Install the center exhaust pipe assembly. 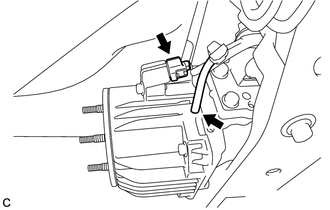 (a) Inspect and adjust transfer oil (See page ).